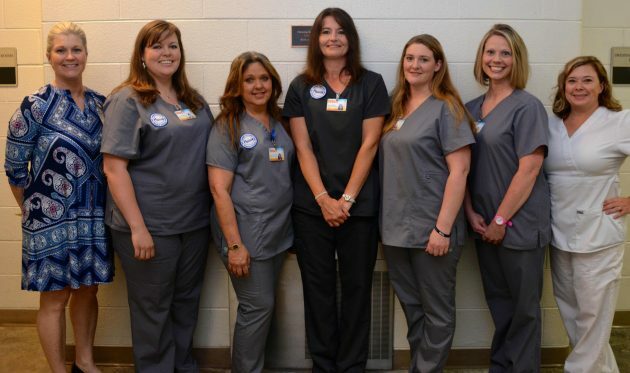 Several local women recently took part in the Health Services completion ceremonies at Caldwell Community College. The ceremony, on Tuesday, May 29 at the J.E. Broyhill Civic Center in Lenoir, honored graduates of the Pharmacy Technician, Nurse Aide and Phlebotomy Continuing Education training programs. Students from Alexander, Caldwell, Catawba, Watauga and Wilkes counties were among the nine different classes. Nurse Aide – Group 2 pictured from left to right: Instructor Jodie Webb, Jessi Studstrup of Sugar Grove, Evelyn Edmisten of Boone, Wendy Martin of Zionville, Tiffany Miller of Boone, Emily Ahrenberg of Vilas and Instructor Amy Robertson.